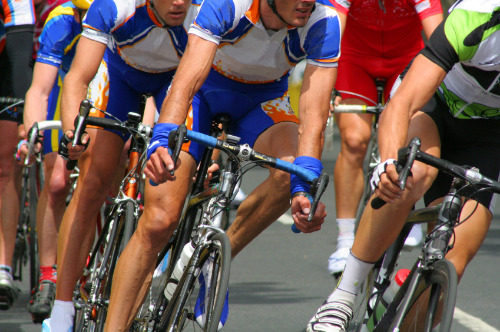 Certainly pro sportsmen will always look for the thinnest edge to gain any advantage over a competitor, so it follows that they would have little hesitation in removing body hair if they felt they could gain a physiological performance improvement – here, the swimmers and cyclists obviously come to mind. Other factors could be more psychological – who wouldn't want to mess with an opponent’s head before the start of a competition by highlighting ripped muscles, clearly demonstrating the painful hours expended in the gym, road, water etc. Athletes can be notoriously brittle so any seed of doubt placed in a competitors mind can be critical in improving one’s own outcome. The “improvement” could be merely in one’s own mind, which at the end of the day is still an improvement! Arguably, swimmers have been de-fuzzing longer than any other sportsmen. In their case, there is actual evidence of performance improvement - A study conducted by the American College of Sports Medicine compared freshly shaven swimmers with a control group in the pool. While performing the breast stroke over 400 yards at 90 percent effort, the athletes with no hair experienced a reduction in blood lactate, a decreased VO2, and an increase in stroke length. To emulate this further, high tech body suits have been developed in recent times, although many have been banned in pro competition for their effectiveness. Road and track cyclists have also long been known to remove their leg hair initially and then arm and body hair. In this case, performance enhancement is unproven, so there must be other reasons for the practice. The most plausible reason is to mitigate road rash – crashes are all too common and having hair-free skin helps in the cleansing and healing of the wounds, as grit is less likely to be trapped in the cuts and grazes. As with many other athletes, deep tissue massages are essential for top performing cyclists – being hair-free certainly helps minimising the pain and gaining the maximum benefit of the massage. Anyone who has watched cycling will have noted the skin-tight Lycra that the riders wear. Tight-fitting clothes, worn hours on end, perhaps in very high temperatures isn't the ideal solution for preventing chaffing in some of the most sensitive body areas, unless friction is reduced through the removal of that pesky body hair! Again, these are amongst the longstanding supporters of having it off (hair that is!). This time entirely for aesthetic reasons to show off those rippling muscles to the max (in conjunction with copious applications of fake tan and the dreaded competition dieting). Footballers, rugby players, tennis players and now triathletes, amongst many more sportsmen have succumbed to the need to be free… of hair! Their reasons are essentially as described above. The hair is only cut off at the skin surface and you will see and feel stubble in a few days. Shaving is required every few days to achieve that smooth-skin feel. Ingrown hairs can become a problem, escalating to folliculitis (inflamed hair follicles, red tender spots, can have a surface pustule). These are often called "red bumpies". The red bumpies are ugly. This method is effective for pulling out large amounts of hair at one time. The method involves spreading warm wax over an area and allowing the wax to cool. The cooled wax grabs onto the hairs. The wax is then quickly pulled off in the opposite direction of growth, pulling out the hair shaft and bulb. Because hair base is pulled out, overall results will last longer than shaving. Some hair growth may appear after approximately 10 days; but some people can go between four and eight weeks with good results. Results are best when done by a trained professional. There tends to be less likelihood for ingrown hairs with this method, compared to shaving. Most professionals will wax the bikini lines. It is possible to do your own waxing at home, but you may need some help. Some people believe that the hair grows back finer after waxing, but others disagree. Some people find the procedure very painful. The wax can be too hot and damage skin. Some people can get skin irritation from the wax itself. The wrong wax can be used in delicate areas. Some people are uncomfortable having their groin area exposed to a waxing professional. Not all professionals will wax the male undercarriage. For the best results, you must wait for four weeks after you last shave before waxing. The hair must be a certain length for the wax to grab it and pull it out. This is a chemical lotion application that is done at home. The chemical is applied and left for some three to 15 minutes. The chemical literally melts the hair away. It's inexpensive compared to waxing. Some people have fewer ingrown hairs with this method. The IPL/laser machine emits light at various wavelengths, energy output and pulse widths. The technician needs to tune the laser to target the melanin in your hair. This procedure works best on fair-skinned people with dark hair. Hairs in the anagen phase are more easily destroyed than those in the telogen phase. For this reason, the treatment must be done in a series, separated by some four to six weeks. Depending on your individual requirements, 6-12 sessions will be required. Roughly 80 percent of hair reduction is achieved with the initial treatment. Over 80 percent hair reduction occurs in 80 to 90 percent of the good candidates. Because of the high success rate, women are more likely to have the entire bikini area receive laser treatment. It is not uncommon for women to have arm pits, legs and a good percentage of the groin area treated with laser. A large number of people have complete elimination of any ingrown hairs and infections. This is a huge advantage in the groin area. Red shaving bumps are eliminated. Less time consuming over the long haul than shaving or other at-home methods. This procedure is painful compared to shaving; but less painful than waxing. If the IPL/laser is not properly adjusted, it can be ineffective in hair removal or it can burn the skin. Laser procedure does not work well on true blonde, red and grey hair. It does not work well on very dark or tanned skin. Some touch-up work may be required once or twice per year.